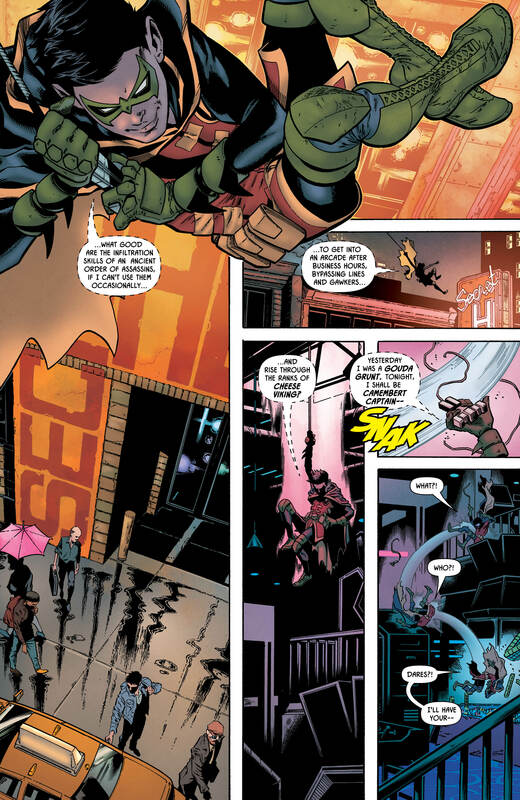 With the wedding of the decade right around the corner, DC are wisely capitalising on the impending nuptials with a series of prelude one-shots featuring some of Batman’s greatest villains and most loyal allies crossing paths. 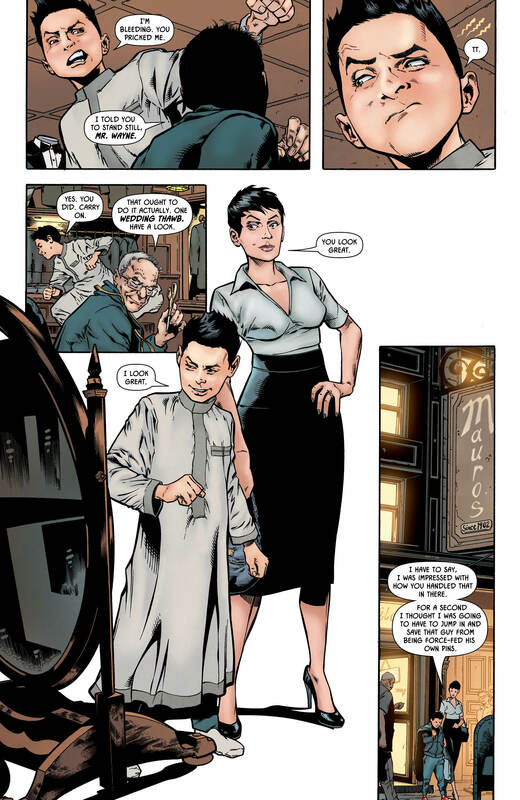 This first of these one-shots opens with Damian and Selina doing a little wedding outfit shopping, before the young Master Wayne excuses himself to pay a visit to his favourite local arcade — only to run into a family member whose identity is, let’s be honest, heavily telegraphed by both the title and the cover of this comic. However, as you can see from the eleven(!) 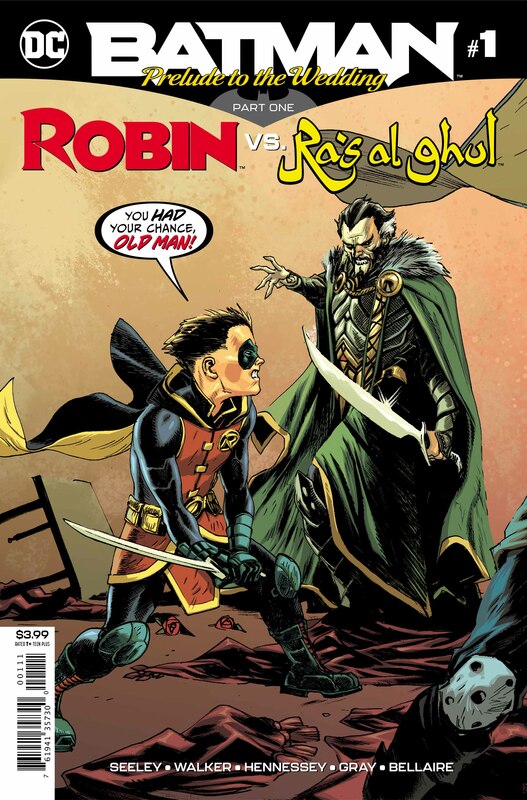 page preview below, writer Tim Seeley doesn’t attack the confrontation head-on, providing a creative way to bring the grandson and grandfather together by having Damian first battle an entirely new – yet strangely familiar – foe. 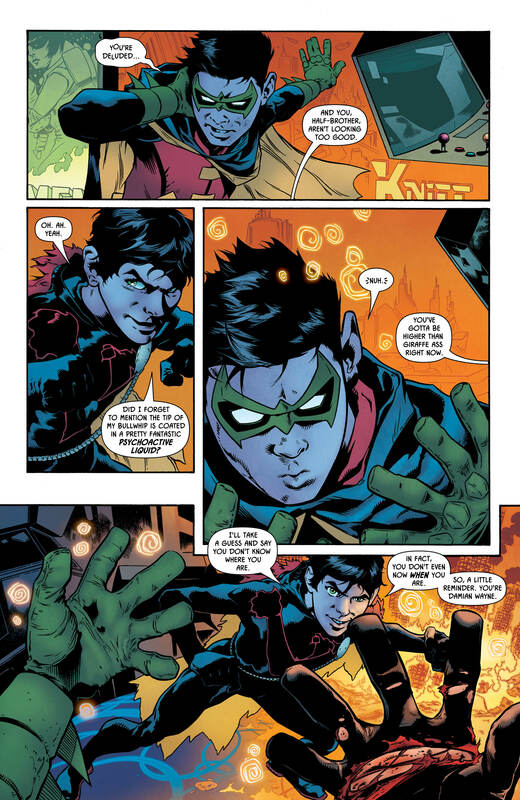 Brad Walker does a serviceable job with the artwork here, even if the costumed Damian ends up looking a heck of a lot older than his civilian self for some reason. 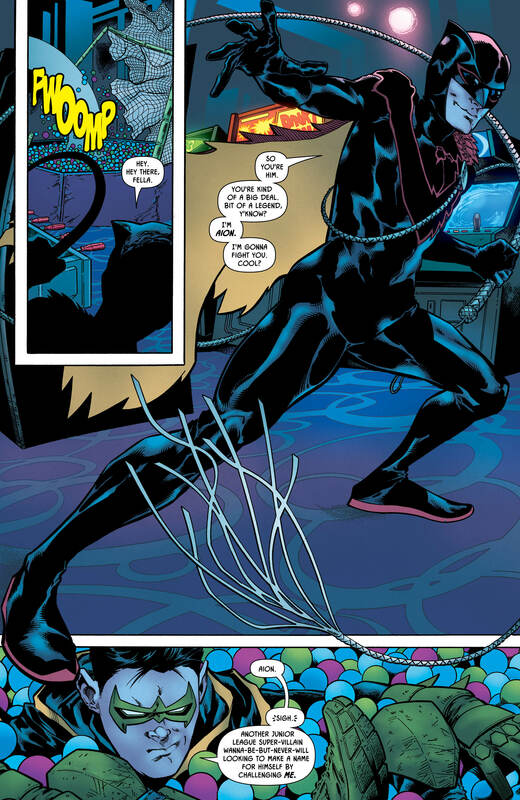 There’s also the occasional awkward pose during the skirmish, making things seem a little overly choreographed and sterile, but for the most part things flow smoothly, and Walker does a great job nailing the key beats of the conflict – particularly the unmasking of “Aion”. 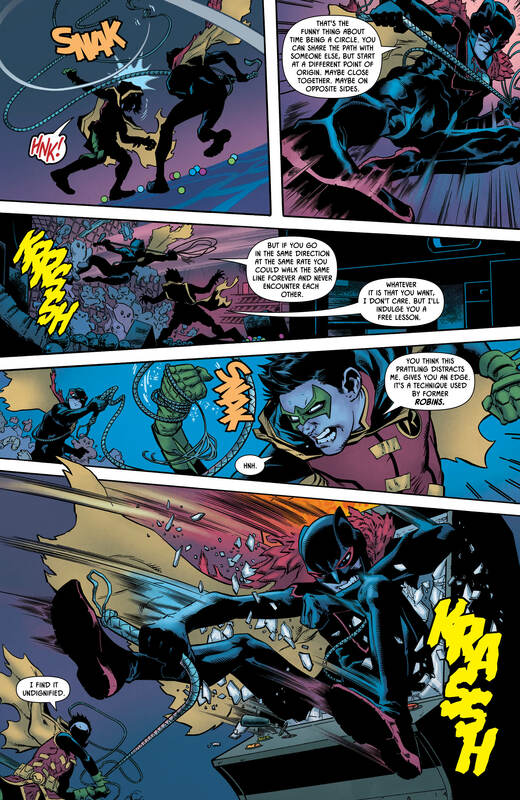 Walker’s work is helped immeasurably by the inks of Hennessey and Gray, who display a light touch that helps to give the proceedings some much-needed delicacy, particularly the scenes featuring the out-of-costume Damian and Selina. 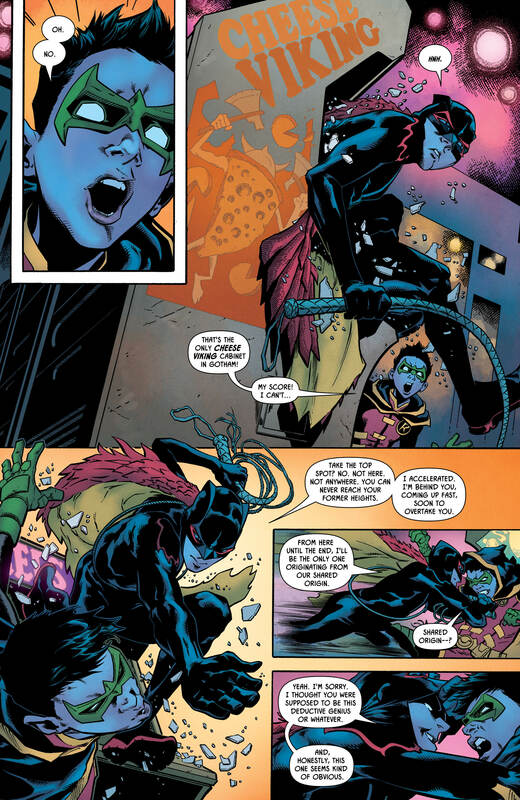 Jordie Bellaire’s colours round things out nicely, staying relatively restrained for the most part before cutting loose during some of the key moments which require some striking visual contrast. Again, it’s worth mentioning that the reveal of “Aion” and his piercing green eyes is masterfully executed. 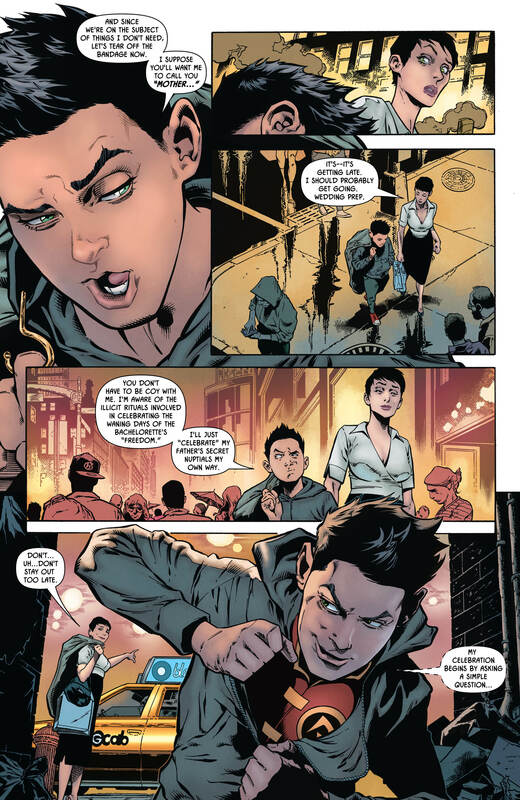 It’s perhaps odd that the actual exchange between Damian and Ra’s – and yes, there is one – is pretty much the least interesting part of the entire issue. 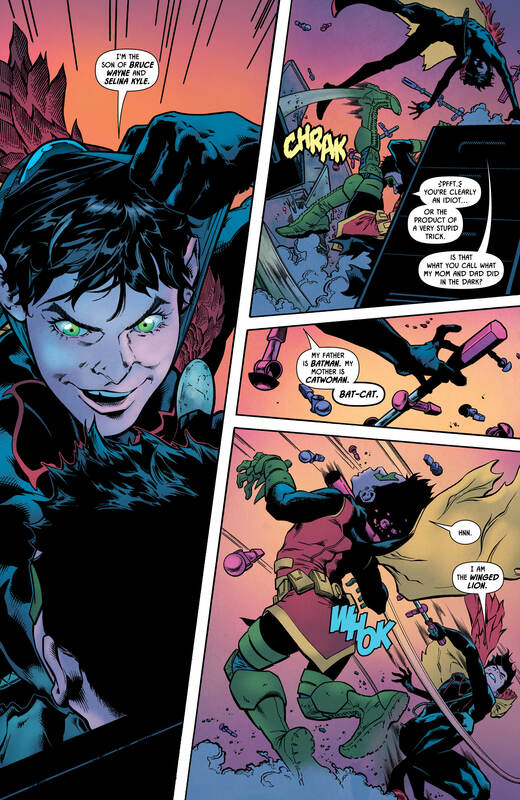 The “Aion” stuff is cool, and suitably Damian-y, but it’s the scenes which bookmark the issue featuring the young Robin and his stepmother-to-be that really carry the weight here. Their interactions are humorous and authentic, and while the youngster is still his usual surly, tutting self, there’s a real undercurrent of charm and intrigue at play here. The issue wraps up with what is a surprisingly touching moment, before ending with a genuinely goosebump-raising epilogue, illustrated by Otto Schmidt. 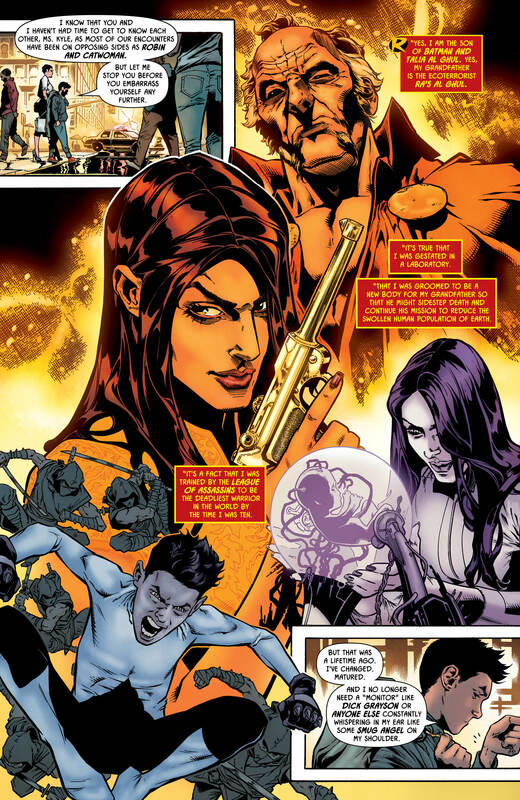 Seriously, I’m not sure you could do much more in just two pages than Seeley and Schmidt do here. 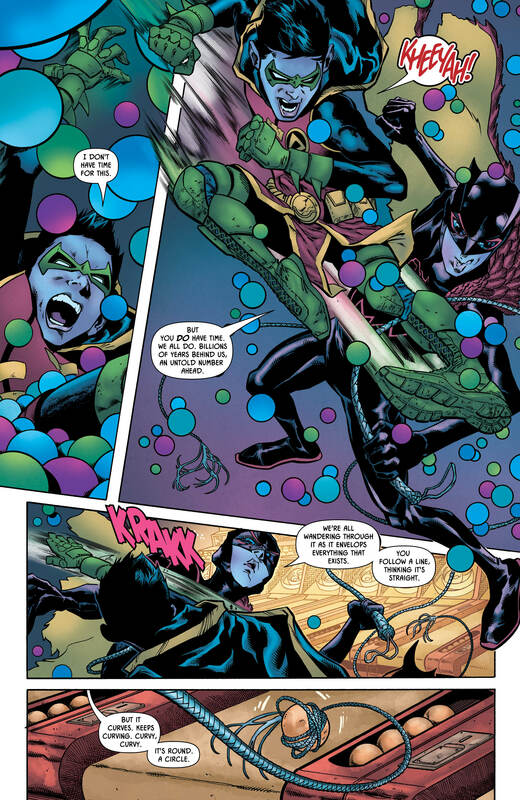 Ultimately then, while it’s perhaps not an essential read in the grand scheme of things, the interactions between Damian and Selina are probably worth the cover price alone, and suggest an interesting dynamic that I can’t wait to see explored in more depth once the wedding is behind us. And, while some of the subsequent one-shots sound slightly less appealing (“Red Hood vs Anarky?” really? 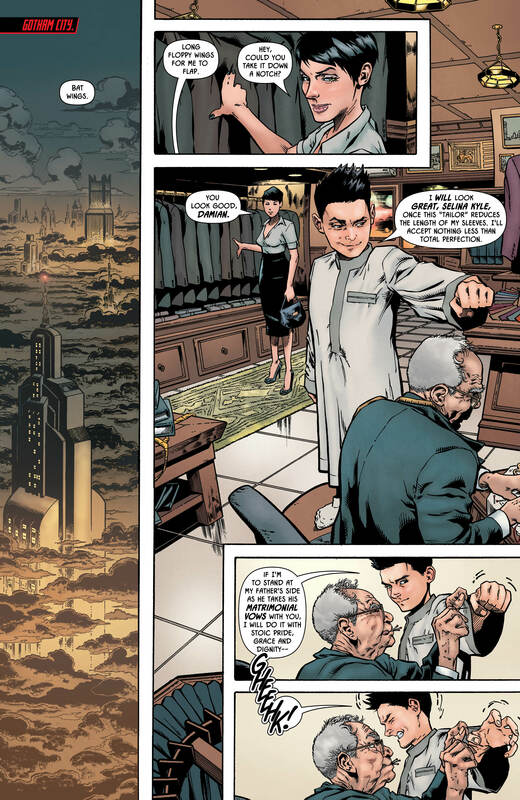 ), this issue absolutely does its job in whipping up excitement about what is likely to be one of the most significant moments in Batman’s fifty-two year history.